Even though all the post I have here is way too delayed. I do hope that some would still interested and would pay attention to this.. hehehhe.. 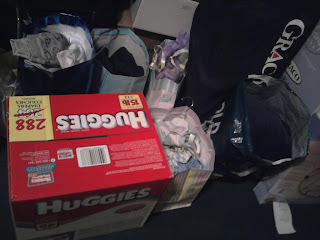 I just want to share you the billions of clothes I got during my Baby Shower, that I never even buy a new one. I have friends who got their son's clothes worn out already and instead of buying a new one. They gave it to me. I am trying to be practical here because infants clothes they wear it out so fast. So, I double washed it and since it still in good shape, my son is enjoying and wearing it out too. Some clothes were brand new, and bigger size that way he can wear it til his 12 months old. Well congratulations dear, Don't worry, If I was on your shoes I'll be also doing the same with my baby. anyways congratulations again and goodluck in broughting up your new baby!